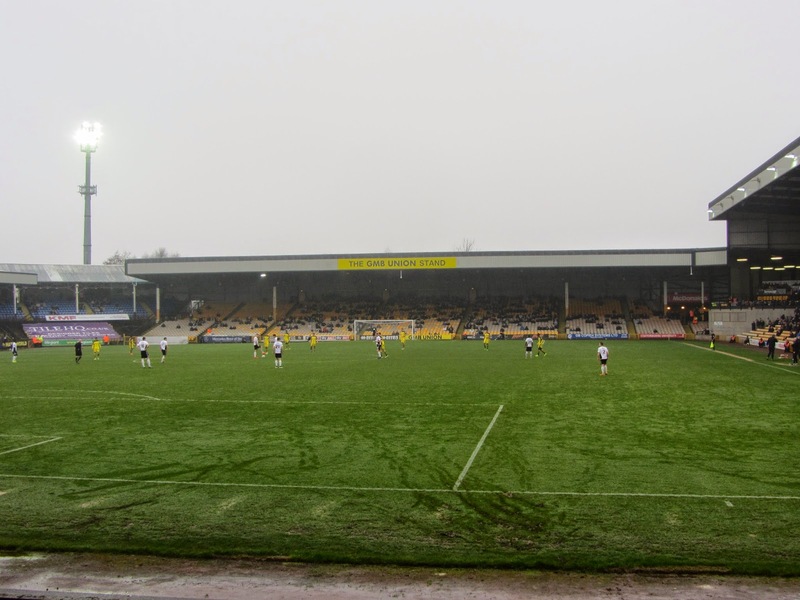 My fourth ground of 2015 was on Friday 3rd April at Vale Park in Burslem, Staffordshire. The match was Port Vale vs. Colchester United in Football League One. 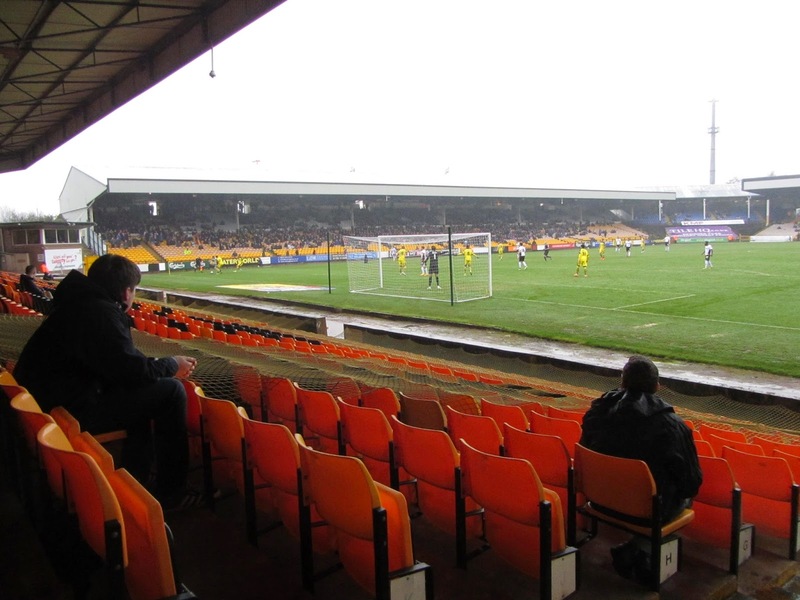 Vale Park is located in the town of Burslem in the northern part of the wider city of Stoke-on-Trent. The ground sits is bordered by Burslem Park to the south and Sproson Park to the north though also backs onto a residential area on its eastern side. The venue is 1.5 miles from the nearest railway station at Longport and has been home to the club since 1950. The tallest stand in the ground is the Lorne Street Stand which runs alongside the eastern side of Vale Park. This stand was opened in 1999 to replace the former uncovered concrete terrace which had stood there before. It was intended to seat 5,000 fans but still remains unfinished with seats only in place for half of the lower deck. However, the upper deck was completed giving the club the opportunity to provide balcony-style hospitality boxes. The Lorne Street Stand also includes the club reception and other facilities in use by community organisations. The Railway Stand is on the opposite side of the pitch - this was formerly a mixture of seating and terracing until the latter was upgraded during the 1990s. Several supporting columns reside in the middle of the stand and the roof does not extend out to all the seats at the front of the stand. Next to this the north-west corner has a small two-tier structure with uncovered seating in the lower section and covered seating in the upper section. This area is hemmed on by the Railway Stand on one side and the Bycars Road End on the other. The Bycars Road End is a single tier stand with two supporting columns on each side - as with some of the other stands those at the very front are a little open to the elements. Behind the goal at the southern end of Vale Park is the Hamil Road End - this 4,500 capacity stand houses the away fans and also has some stanchions half-way up the stand. On the outside of this structure, the club shop is attached The south-west exterior of this structure backs onto to the club shop and there is also a pub across the car park. Port Vale come into the game off the back of some really poor results and raced out of the traps early on to threaten the Colchester goal. Vale looked particularly dangerous down the wings and the U's goal led a charmed life in the opening half-hour. After this the visitors came back into the game and only a smart save from Sam Johnson prevented George Moncur opening the scoring towards the end of the first half. The second period saw Colchester well on top and they took the lead in the 57th minute as Moncur was able to play a 1-2 with Chris Porter on the edge of the box before having the time to control the ball and drag it into the bottom corner. The away side had several chances before grabbing a second goal on 77 minutes. Some sloppy passing from Vale saw the ball fall to Jacob Murphy who played a quick 1-2 with Porter before beating a defender for pace and drilling his shot into the bottom corner of the net. The hosts did get one back with a few minutes to go as Louis Dodds slammed home a volley after a corner wasn't cleared properly but in the closing stages it was Colchester who looked the more likely to score again as they claimed a 2-1 win.